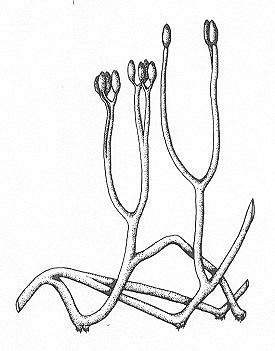 This is the reconstruction of the plant Aglaophyton major by D.S.Edwards (1986). The original name, given by Kidson and Lang, was Rhynia major, but Edwards showed that the central strand did not consist of tracheids with secondary wall thickenings. So the plant had to be transferred to an other genus. In fact Aglaophyton cannot be reckoned to belong to the Tracheophyta and does have affinities to the mosses. The transverse section of the stem resembles that of Rhynia gwynne-vaughanii, but it is larger. The size of the plant is estimated at a maximum of 18 cm. The stem diameter is between 1.5 and 6 mm. In my four pieces of chert this plant did not occur. The photos are from the slides of the Groningen University. 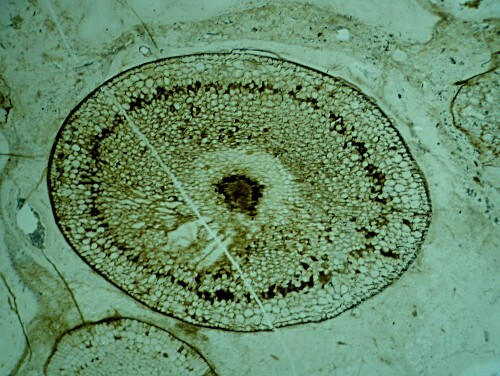 Transverse section of a stem of Aglaphyton major. Diameter 4 mm. Groningen. The lightcolored cells around the central strand formed the phloem. In the dark ring at 3 or 4 cells from the epidermis lived a symbiotic fungus. Click the ring to see this fungus.